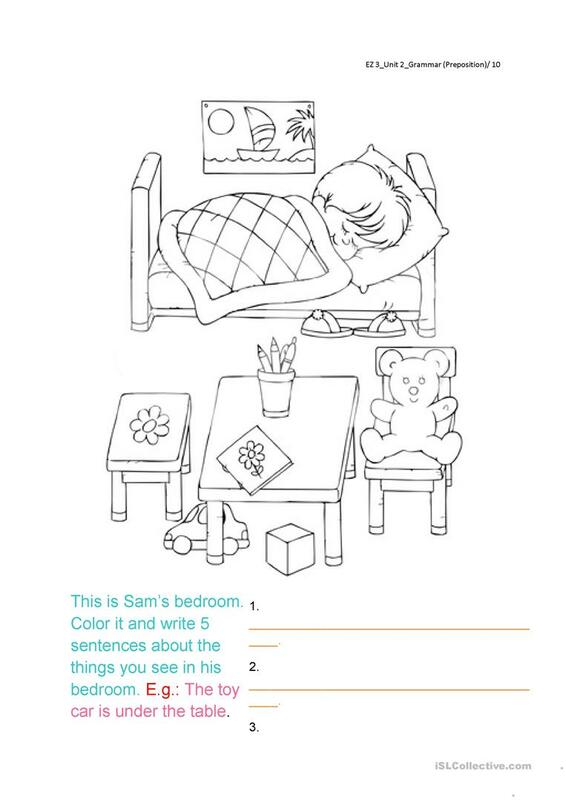 Students have to color Sam's bedroom and describe his bedroom using correct prepositions. E.g. : The toy car is under the table. The present downloadable handout was created for elementary school students at Beginner (pre-A1) level. It is aimed at practising Prepositions in English, and is excellent for improving your class' Writing skills. It is focused on the theme of Toys. Tesa is from/lives in Indonesia and has been a member of iSLCollective since 2012-07-12 09:21:49. Tesa last logged in on 2019-04-25 11:41:04, and has shared 10 resources on iSLCollective so far.